On Saturday at Yale University, in the final of the New Haven Open, the 2008, 2009 and 2010 New Haven champion, 20 year old top seeded #1 Caroline Wozniacki of Denmark (residence: Monte Carlo, Monaco), won the title for the 4th straight year, defeating 26 year old qualifier #45 (last week, this week at a career high: #40) Petra Cetkovska from Prostejov, Czech Republic, 6-4, 6-1 (Caroline is shown with the rather petite glassware after the match). Caroline's prize is $103,000; Petra's is $55,000. Caroline struck 1 ace with 4 double faults, and won 63% of her 1st serve points and 48% of her 2nd serve points, while scoring on 6 of the 12 break points she reached against Petra and totaling 67 points. Petra hit 1 ace with 2 DFs, and won 46% of her 1st serve points and 33% of her 2nd serve points, as she converted 3 of the 7 break points she reached against Caroline while scoring 49 points in the match. Despite the loss, Petra had the best week of her career, defeating #12 Agnieszka Radwanska in the 2nd round, #9 Marion Bartoli in the quarterfinals, and #5 Na Li in the semis. Petra said: "I'm really happy to be here, to go so long, so far in the tournament. Now when we are in the final, we want to always go further. So obviously I wanted to try to win, to do even better. But today it was just a little bit too much. Caroline, she's just playing great." Caroline and Petra had never before met on the field of combat. 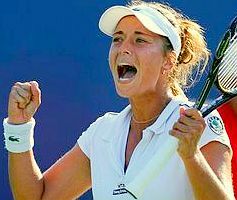 2009 US Open finalist Caroline is now 18-10 in WTA singles finals; this year she won in February at Dubai, in March at Indian Wells, in April at Charleston, in May at Brussels, and in June at Copenhagen before hitting a dry spell. Caroline has a 53-12 singles match record in 2011. Meanwhile, at Grapevine (near Dallas) on Saturday, in the final of the Texas Tennis Open, this year's champion at Birmingham, 21 year old 5th seeded #22 (career high #22) Sabine Lisicki of Germany (residence: Bradenton, Florida), crushed, killed and destroyed the 2010 Madrid champion, 24 year old qualifier #107 (career high: #15) Aravane Rezai from St. Etienne, France, 6-2, 6-1 (Sabine is shown after match point). Sabine lost only 13 games in 5 matches during the week. Sabine's prize is $37,000; Aravane's is $19,000. Sabine struck 3 aces with 1 double fault, and won 85% of her 1st serve points and 83% of her 2nd serve points, while scoring on 4 of the 5 break points she reached against Aravane and totaling 57 points. Aravane hit 1 ace with 4 DFs, and won 60% of her 1st serve points and 35% of her 2nd serve points, and never reached a break point against Sabine while scoring 29 points in the match. Sabine now leads Aravane are 2-1 in career matches. They had not met since 2009, when, on a hardcourt in round robin play in Bali, Aravane defeated Sabine 1-6, 6-3, 6-4. Sabine is now 3-2 in WTA singles finals; she won at Birmingham this year, and at Charleston in 2009, and reached the final at Luxembourg the same year and at Tashkent in 2008. Sabine injured her left ankle badly at Indian Wells last year, and did not show signs of complete recovery until late this spring. She has a 44-15 singles match record this year, and has won 22 of her last 26 matches. 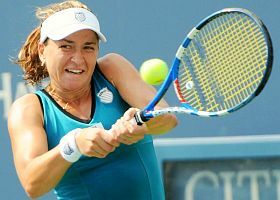 Aravane is now 4-3 in WTA singles finals; she won at Madrid and Bastad in 2010, and at Strasbourg and Bali in 2009. Aravane, who was distracted earlier this year by offcourt family problems, has a 12-19 singles match record in 2011. 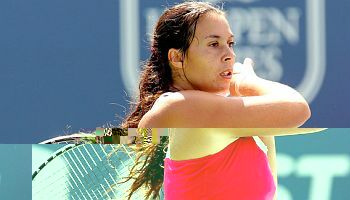 Marion said: "It was important for me to get more matches before the [US] Open started. I think it's just the perfect preparation. I have some matches here to play. I can practice as much as I want so, it's perfect." 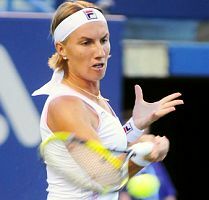 Agnieszka said: "I'm very happy that my first match was very quick. Nothing's worse than playing three hours in your first match, and then being really tired." Christina struck 2 aces with 1 double fault, and won 60% of her 1st serve points and 48% of her 2nd serve points, while scoring on 7 of the 10 break points she reached against Svetlana and totaling 65 points in the match. Svetlana hit 3 aces with 1 DF, and won 51% of her 1st serve points and 44% of her 2nd serve points, as she converted 4 of the 5 break points she reached against Christina while scoring 58 points in the match. Christina first received substantial notice when she defeated Svetlana earlier this year in the 2nd round at Indian Wells, 7-6(4), 7-6(7). 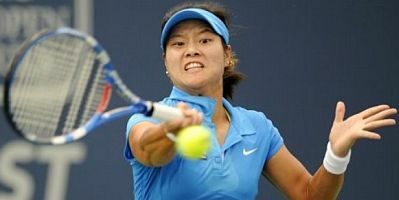 Last week at Cincinnati, Christina defeated # 1 Caroline Wozniacki in the 2nd round, 6-4, 7-5. Elena struck 1 ace with 4 double faults, and won 72% of her 1st serve points and 30% of her 2nd serve points, while scoring on 5 of the 9 break points she reached against Jelena and totaling 95 points in the match. Jelena hit 4 aces with 7 DFs, and won 66% of her 1st serve points and 40% of her 2nd serve points, as she converted 5 of the 10 break points she reached against Elena while scoring 96 points in the match. Anastasia said: "I just kept on fighting on every point and thought, `I'm not going to give her this match easy. So, if she wins, she has to really try hard.."
Caroline will play Christina McHale in the quarterfinals. Christina defeated Caroline last week at Cincinnati. Caroline said: "I learned more about myself. I'm looking forward to the next match." Marion struck 3 aces with 10 double faults, and won 64% of her 1st serve points and 45% of her 2nd serve points, while scoring on 6 of the 21 break points she reached against Klara and totaling 102 points in the match. Klara hit 2 aces with 5 DFs, and won 54% of her 1st serve points and 42% of her 2nd serve points, as she converted 4 of the 10 break points she reached against Marion while scoring 88 points in the match. Petra said: "I was able to keep up with her and then make some good aggressive shots. There were some key moments at the beginning of the third set—losing the second set after being up 3-1 was difficult, so I really had to keep fighting and focusing at that moment, and it worked out. "This was also only my second night session on the WTA. 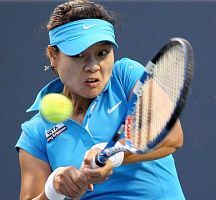 My first one was a few years ago against Hantuchova at Indian Wells." Anabel struck 2 aces with no double faults, and won 63% of her 1st serve points and 42% of her 2nd serve points, while scoring on 6 of the 11 break points she reached against Elena and totaling 82 points in the match. Elena hit 3 aces with 3 DFs, and won 52% of her 1st serve points and 43% of her 2nd serve points, as she converted 4 of the 10 break points she reached against Anabel while scoring 72 points in the match. Christina said: "I played pretty solid. 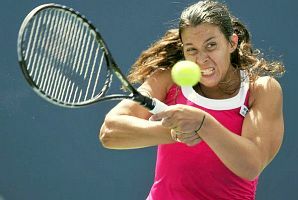 Carla has a really good backhand, so I was trying to get her moving on that side, not just stand in one spot hitting it." About having a chance to defeat #1 Caroline Wozniacki two weeks in a row, Christina said: "I'm excited to play her again. Last week I served well, moved well, and got to a lot. I'm just going to play my game and not worry about what she might be changing." Caroline, now 16-0 lifetime in New Haven, struck 1 ace with 3 double faults, and won 69% of her 1st serve points and 45% of her 2nd serve points, while scoring on 4 of the 16 break points she reached against Francesca and totaling 79 points. Francesca hit 4 aces with 4 DFs, and won 70% of her 1st serve points and 35% of her 2nd serve points, as she converted 2 of the 7 break points she reached against Caroline while scoring 69 points in the match. Caroline said: "Francesca is a tough opponent and we had some good rallies, one of them where we both kind of stretched all we could, and I came out on top—it was a very important point in the first set. It goes one way one day, the other way another day. I'm just happy it went my way today. I'm happy to be in the final again." Francesca said: "[Caroline is] very consistent. But I didn't catch my chances. When I catch my chances, it's good tennis. When I don't take it, she takes it. That's the difference between being No.1 and being where I am. I have a good feeling right now—I just need to believe and keep going. With more discipline I can do very well." There were 13 breaks of serve in the match. Petra struck 1 ace with 10 double faults, and won 62% of her 1st serve points and 36% of her 2nd serve points, while scoring on 7 of the 21 break points she reached against Na and totaling 117 points in the match. Na hit 2 aces with 6 DFs, and won 51% of her 1st serve points and 48% of her 2nd serve points, and converted 6 of the 12 break points she reached against Petra while scoring 113 points in the match. Petra is having the best week of her career. 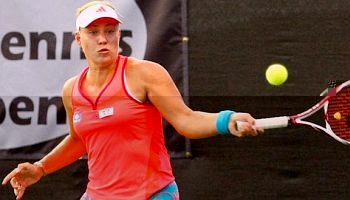 She defeated #12 Agnieszka Radwanska in the 2nd round, and #9 Marion Bartoli in the quarterfinals. About the tiebreaker, Petra said: "When [Na] had match point, I was just trying to stay calm, because it was just a couple minutes ago it was me who had match points, now her. I had to tell myself it might be me again in a couple of minutes." Na said: "This week wasn't bad, because I played three tough matches here. I got a little bit more feeling on the court. I know it's not my best tennis, but it will push me for the US Open." Dallas: The main draw for Dallas has 8 seeds, with no 1st-round byes. There are 4 qualifiers in the main draw. Qualifying (2 rounds) starts on Saturday, qualifying finals are on Sunday. Sabine said: "It's definitely important for me to get a win after not playing so well in Cincinnati. I had a bad day there." Shahar said: "I'm happy I won. I did the right things and I was very aggressive when I needed to be. The first set was really good for me and I made a few more mistakes in the second set. But I'm happy I got through the first round and hopefully will play better the rest of the tournament." Sabine said: "I think I'm hitting the ball cleaner with less errors. Still a couple too many, but I'm a perfectionist, and it's getting better every day. It's great to have so many good matches under my belt in preparation for the US Open." Aravane said: "It was a pretty tough match. [Elena is] a very good player with a good serve and a good return. I tried to be as relaxed as I could and fight as much as I could. I was really consistent and aggressive, and that was the key." Link to many postmatch interview & match highlight videos of WTA players at the 2010 WTA Player Videos page.